I am convinced that at birth the cake is already baked. Nurture is the nuts or frosting, but if you’re a spice cake, you’re a spice cake, and nothing is going to change you into an angel food. Tall, slender Violet Mathers is growing up in the Great Depression, which could just as well define her state of mind. Abandoned by her mother as a child, mistreated by her father, and teased by her schoolmates (“Hey, Olive Oyl, where’s Popeye?”), the lonely girl finds solace in artistic pursuits. Only when she’s hired by the town’s sole feminist to work the night shift in the local thread factory does Violet come into her name, and bloom. Accepted by her co-workers, the teenager enters the happiest phase of her life, until a terrible accident causes her to retreat once again into her lonely shell. Realizing that she has only one clear choice, Violet boards a bus heading west to California. But when the bus crashes in North Dakota, it seems that Fate is having another cruel laugh at Violet’s expense. This time though, Violet laughs back. She and her fellow passengers are rescued by two men: Austin Sykes, whom Violet is certain is the blackest man to ever set foot on the North Dakota prairie, and Kjel Hedstrom, who inspires feelings Violet never before has felt. Kjel and Austin are musicians whose sound is like no other, and with pluck, verve, and wit, Violet becomes part of their quest to make a new kind of music together. 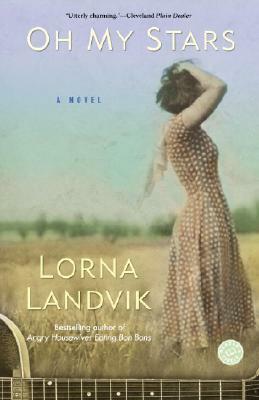 Oh My Stars is Lorna Landvik’s most ambitious novel yet, with a cast of characters whose travails and triumphs you’ll long remember. It is a tale of love and hope, bigotry and betrayal, loss and discovery–as Violet, who’s always considered herself a minor character in her own life story, emerges as a heroine you’ll laugh with, cry with, and, most important, cheer for all the way. Lorna Landvik is an actor and comedian who has written and produced plays in which she also performs. The author of five previous novels, she is married and the mother of two daughters. "The Minneapolis author plunges fearlessly into sticky situations and uncomfortable truths in this atmospheric tale of a wounded soul on a journey of self-discovery in 1930s North Dakota."